D. 333333 now updated! Easy and Hard mode included! V2 Bug Fixes Inside! Edit by Terry: Added links to your previous threads. Also, added some screens to this post! Edit by Sendy: NEW VERSIONS UPLOADED! See the bottom of the post for changelog! * Changed the flags so that the 'rescue flag' is set when you touch a crewmate, as opposed to merely talking to them. * Added Easy Mode - based off of Hard Mode, but with every room edited to be somewhat easier. * Fixed the whole Sea of Chaos riddle fiasco, and added a visual cue to both modes. Please let me know what you think, especially of the Easy Mode! Re: D. 333333 now updated! Easy and Hard mode included! I clocked about 90 minutes total on my trip through "HARD MODE! FOR HARD PEOPLE!" I managed to snag all 20 trinkets, had around 700 deaths overall. Probably the most difficult and polished custom stage I've played to date, it really tickled my fancy. I can tell, just from playing through it, that a lot of effort got put into it. Even some of the room names got me to laugh out loud, and I'm normally a solemn and quiet gamer, even when frustrated. The two that got me best were "We're no strangers to love" for obvious reasons and "Yes, I have an unlimited supply of them" because of what it was a reply to (implicitly). I'll keep my eyes peeled for bugs or flaws, if I find any I'll report them here. Did hard mode of course, it was really really incredibly frustrating in parts but I got all 20 trinkets and all the crewmembers. There's a small typo in the final room (time is spelled wrong), in case you ever get around to updating again, but I didn't notice any major bugs. The secret area was fun, and all the dialog was quite enjoyable. It would be nice if some of the trinkets involved harder puzzles, since they're supposed to be extra collectables for adventurers but paled in comparison to the difficulty of the final area. It felt weird having the secret area before the hard part of the game. Very nice level, I really liked the polish and the difficulty. Nice thorought, besides 'You're on your own now' being ridiculously hard. The rest was reasonable. About the 'riddle' terminal: The Chief is Verdigris, located in the Green sector. The lake of chaos is in the purple area, Violet's dungeon. You might want to fix that. Is the version I downloaded in the original thread the easy version or the hard version? Well, the reason for that is... that... it's.... um... Ok, I got nothing Thanks for pointing this out - it's not the first time I've confused green for purple in my own level *faceplant*. Maybe I'm internally colourblind. There's another blooper, in the Easy Mode of 's room, a 'bouncing triangle' is referred to, which no longer exists in that version. Not game breaking stuff but it's annoying me. Dinoquark - About the trinket challenges, I somewhat agree. The problem I had with making the overall map is that I started with a 5x5 level, which I eventually expanded to 5x6 when I was making the Blue Zone. That's why in Style over Substance Squared you're just falling - it's a linker room. As the level grew I couldn't expand vertically without messing up the first two levels I'd made, and creating a gap in them, so I began to add horizontally. Little did I know, there's a limit of 20 in either the X or Y direction for maps. So, the net result is that I had to make the levels quite linear, and there isn't much room for the trinkets to have their own challenges and rooms - which is ideally what I wanted. You can sort of see what happened when you look at the pixel-map that the VVVVVV level mapper program creates (don't do this unless you're OK with spoilers or have 100%ed it, though!)... On the left hand side, the tunnels are quite spacious and there's more free space and wall. As you look more and more to the right, there's more economy of space, smaller tunnels, and less unused wall-space, as I tried to shoehorn as much as I could into the limit I'd discovered! If and when I do another level, it'll be a lot less linear and will feature multiple paths and more exploration! Everyone else - thanks for your comments! I couldn’t get into this one. I'm not really sure why. The large level size is a bit intimidating, but that's not really an issue. Checkpoint placement frustrates me in places like “The Awkward Terminal” where I have to redo a ton of stuff when I die once. Room design and humor was very nice though. In any case, congrats on getting featured! I still might come back to this level when I have a lot of free time. Three pairs of sunglasses, indoors, at night. This level was extremely frustrating. I shudder to think what Hard Mode is like. That is the sort of level where every time I clear a challenge, I say, "Well, I'm glad I don't have to do THAT ever again in my life." Fortunately, your design was so good that it managed to keep me playing. It was close, though. I got 19/20 trinkets. I missed the Lover's Leap one, because I said, "well, this is obviously the sea of chaos, but I guess I had to do something in the Green Area to unlock this." 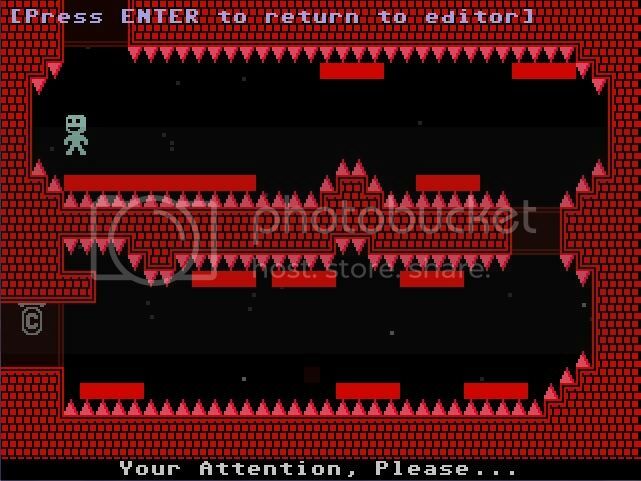 After clearing the game, I decided to edit your level and add a few warp tokens so that I could easily return to Lover's Leap, get the trinket I missed, go to the heart room, and then warp back to the end of the game. I hope you don't mind. The alternative was replaying multiple areas, including the Final Area, and see above for my feelings on that. The whole "Hello I'm from Earth and I created this" schtick seemed a bit self-indulgent to me. EDIT: Janky Walk-in Trepanning Machine is the best name of any room, ever. 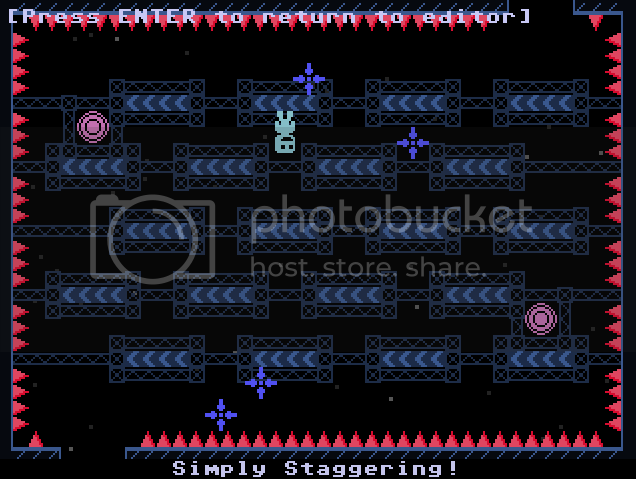 I love this level, even though it's really hard for me, and I've hardly done any of it. Little did I know, there's a limit of 20 in either the X or Y direction for maps. ...isn't the main game map 20x20, plus those other areas? Believe it or not, I was worried that I'd made Easy Mode TOO easy . My biggest problem as a designer is not so much finding a difficulty curve, but normalizing that whole curve, so that the majority of players can play through to the end. Hard Mode is a perfect challenge to me, and Easy Mode is great for quick playthroughs. I've probably played my level more than any other level, but then I did design it primarily to please myself. Thanks... I learned a fair bit making the Easy Mode version. There's an art to taking a puzzle or athletic challenge, and 'watering it down' so that everyone can beat it, without removing the essence of the puzzle/challenge. This is something I'll be thinking about an awful lot in my next level, which will likely be a lot bigger and a fair bit easier. No, I don't mind. It was probably my mistake that confused you anyway. That was the kind of humour I was going for... As soon as you allow multiple dimensions, you open a sort of pandora's box where anything is possible. So the plot I made, however self-indulgent, is kinda feasable in the game world, I think. If it makes you smirk or smile or scoff, it's job is done. Rather than create a masterpiece in fan-fiction, I just wanted to put in a little bit of text to reward players for being thorough, and to give them a good feeling beyond merely getting the good ending and bragging rights. ..isn't the main game map 20x20, plus those other areas? Yes, it seems the 20x20 limits of the main game are carried over into the editor. It might be nice to be able to exceed these, when making levels that are perhaps 1x50 (like a tower level), but it's adequate for most purposes. At 1000 deaths I've got nineteen trinkets and four people. Apparently I must go back through the purple section entirely to figure out how to achieve the "lover's leap." Since the game doesn't have any "tricks" it appears I will have to jump over and over again to get it right...?